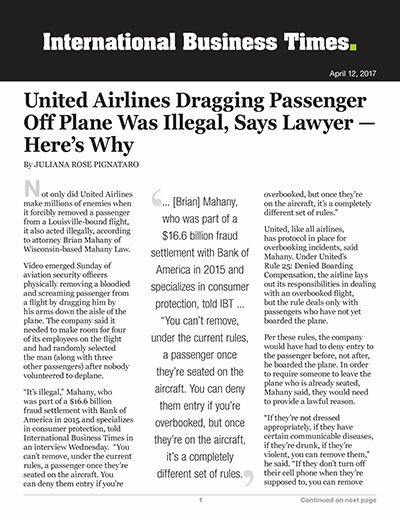 Not only did United Airlines make millions of enemies when it forcibly removed a passenger from a Louisville-bound flight, it also acted illegally, according to attorney Brian Mahany of Wisconsin-based Mahany Law. Video emerged Sunday of aviation security officers physically removing a bloodied and screaming passenger from a flight by dragging him by his arms down the aisle of the plane. The company said it needed to make room for four of its employees on the flight and had randomly selected the man (along with three other passengers) after nobody volunteered to deplane. United, like all airlines, has protocol in place for overbooking incidents, said Mahany. Under United’s Rule 25: Denied Boarding Compensation, the airline lays out its responsibilities in dealing with an overbooked flight, but the rule deals only with passengers who have not yet boarded the plane. Per these rules, the company would have had to deny entry to the passenger before, not after, he boarded the plane. In order to require someone to leave the plane who is already seated, Mahany said, they would need to provide a lawful reason. LawNewz, a website run by legal correspondent Dan Abrams, agreed that the company acted illegally when it forced the passenger to de-plane. The Department of Transportation’s Office of Aviation Enforcement and Proceedings said in a statement Tuesday that it had begun reviewing what happened on the flight. The statement noted that “it is legal for airlines to involuntarily bump passengers when there are not enough volunteers” and that “it is the airline’s responsibility to determine its own fair boarding priorities.” It also explained that the airline would have to give all passengers who are bumped involuntarily a written statement describing their rights and detailing how the airline decided who was bumped, and that “the Department mandates compensation and other protections for passengers who have confirmed reserved space on a flight.” The Department of Justice also said it was reviewing the incident. The United flight was not an “overbooking” incident in the technical sense. Citing the newest apology from CEO Oscar Munoz, Mahany said the airline likely only realized they were in hot water legally days later. It’s unclear what legal avenue the passenger will choose to pursue against the company or what the letter of the law may prescribe — but with the damaging video still making the viral rounds, the aviation giant is unlikely to find much sympathy from a jury.